Yes, this was my second trip to Nashville in April, but this one had one purpose and one purpose only. To Run! We arrived in town Friday afternoon and headed straight downtown for the expo. Since I knew that parking downtown was always at a premium (and I am all about saving money when I can, within reason), we parked in one of the lots at Nissan Stadium and walked across the pedestrian bridge to downtown. If you are ever in Nashville, you NEED to check out this bridge! 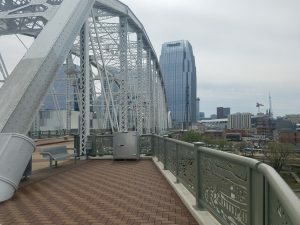 It is the pedestrian bridge that crosses the Cumberland River between downtown Nashville and the Nissan Stadium. 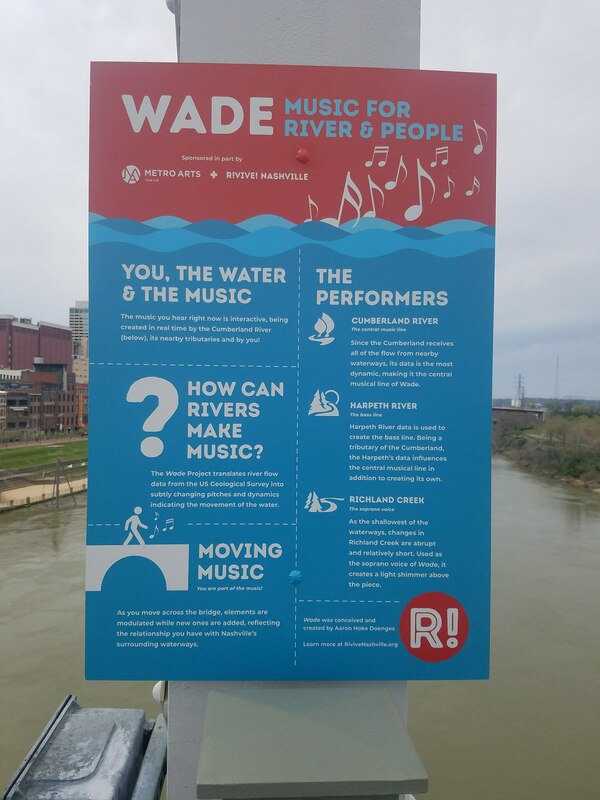 Aside from a great view of the city, this bridge has a unique feature in that the music you hear when you are on the bridge is being created by the river and you! How exactly, I still don’t quite understand but something about the river currents and vibrations. 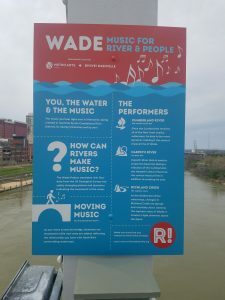 The first time I heard it, my first thought was “wow, that’s really some creepy music to be playing on a bridge” and then I saw the sign explaining what was creating the music. Totally changed my perspective on what I was listening to! 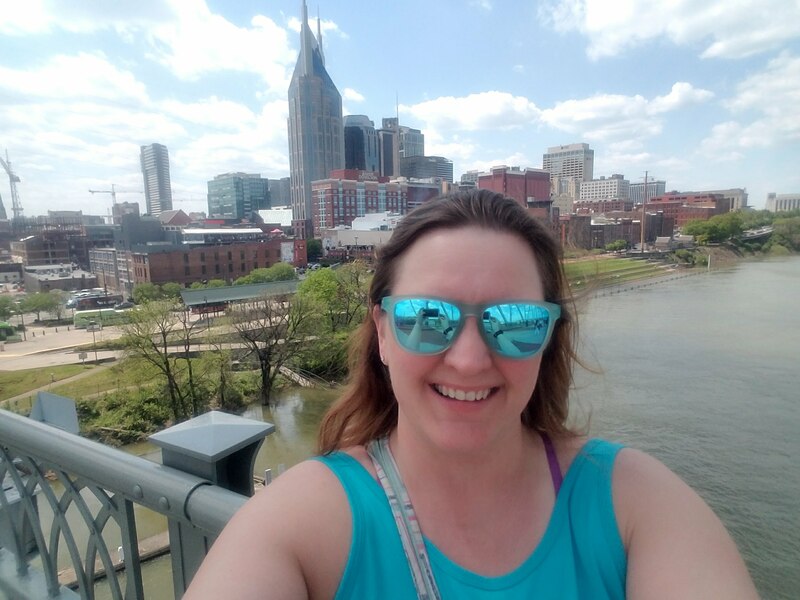 One of my favorite parts of this trip to Nashville, compared to when I was here earlier this month with Darrin… IT WAS WARMER! 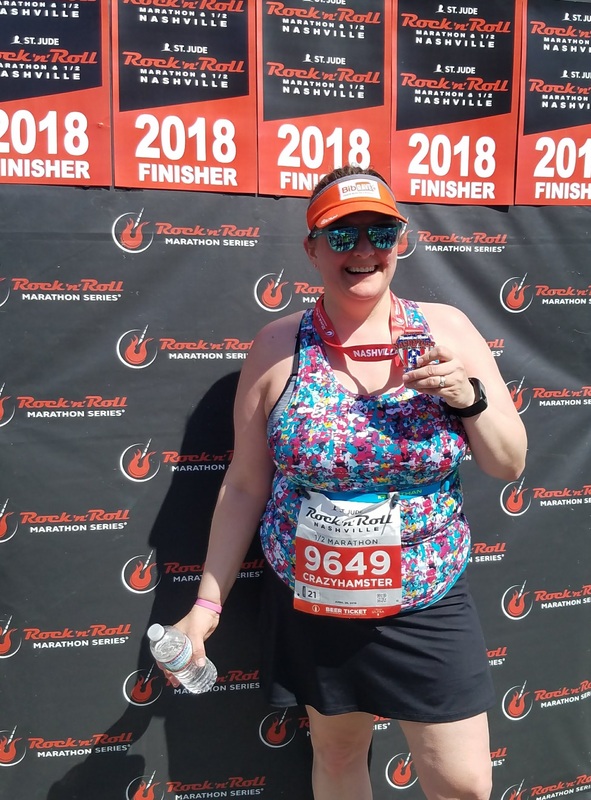 I actually was able to wear a tank and skirt instead of having to dig out the sweatshirt! Now this is was I expected for Nashville weather! Yes, this northern girl is still getting used to summer temps again, since we have not even got to spring yet, but I am not going to complain! I was loving the sunshine! I always get excited for the expo at the Rock n Roll series races. They are always huge and have all kinds of new stuff to check out… not to mention free goodies for runners to pick up! It was shopping time… once we picked up race packets! Thankfully shopping was not delayed much at all, as there was virtually NO LINE at packet pickup! I guess arriving early afternoon on Friday is key! Most of the local are still working and many of those traveling, probably got here earlier! I’m not complaining! HUGE disappointment! Once I found where my name was by looking at the large graphic on the display, I headed over to the hoodie I wanted to buy. There were so many names on the back of the shirt that I couldn’t even read my name! The font was so small and the names were so compacted that everything looked like a blur to me! Guess I’m not buying one after all. I wanted to get a shirt with my name on it… that I could actually READ! We spent the next few hours wandering through booths, checking out new stuff, chatting with vendors and of course buying a few things. Before we left, we picked up our pre-paid parking pass for the next morning. There was limited free parking available at Nissan Stadium for the race, but for a few bucks, you can get a guaranteed spot in one of the reserved lots, near the finish line! Once we left the expo, it was off to check in to the hotel, find dinner and get off our feet! We were so ready to just chill and be done for the night that we didn’t even leave the hotel for dinner – the bar/grill attached to the hotel was good enough for some tired and hungry travelers! By 8pm, I was in bed and becoming good friends with my pillow! Race day was finally here! After a quick breakfast in the hotel (I brought my own morning munchies with me), we took the short drive back to the stadium. We didn’t realize until too late that we took the wrong exit and were not about to get to the lot that we had a guaranteed spot in, but we were in a parking lot close at the stadium and near the finish line so we called it good enough! 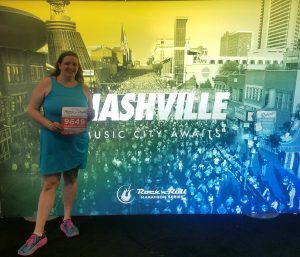 A short walk back over the bridge and up the hill to the Bridgestone arena and it was time to jump into the start corrals. One thing that often frustrates me with RnR events is that, while they do assign everyone a start corral, there is usually no one monitoring who actually starts in each corral! I tried to get in as close as I could to my assigned one, but I realized I was surrounded by people that should have been in so many different corrals, so I really wasn’t sure where I was! 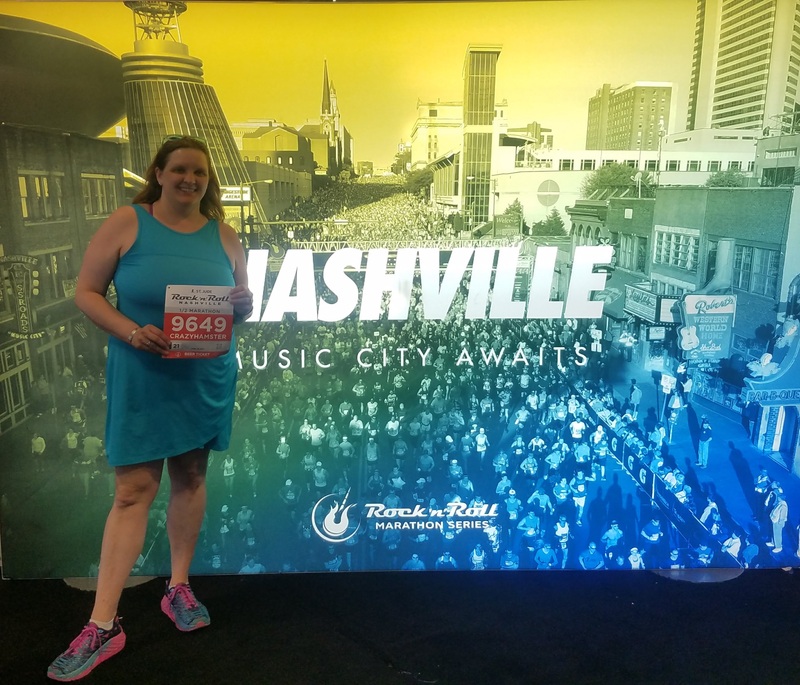 The race starts with a nice downhill run down Broadway, past all the famous HonkyTonk bars and restaurants before going around the block and then going back UP the same hill (just a few blocks over). I think that was THE LONGEST hill in all of Nashville. Ok, maybe not, but when the race is just starting and you are trying to get into a rhythm, long hills like that are a total mental game! Right about at the mile marker, I heard someone yell my name! 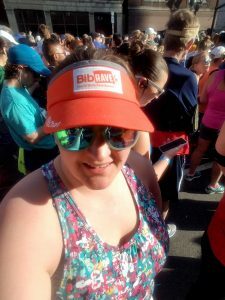 Yes in a sea of thousands of runners and spectators, I heard my name! It was fellow Skirt Sports Ambassador Christy! We missed meeting up when I was in town a few weeks ago and she told me that she would be out of the course this morning. I knew I would never find her, so I made sure she knew what I was wearing and she spotting me. I made a quick detour and was “THAT” runner that darted across a sea of runners to get from one side of the road to the other! I stopped for a quick hug, hello and picture before I was off again! Crowd support for this race is second to none! It seemed like there were spectators on every block, in every neighborhood! Want a beer while you are running? They got you covered! 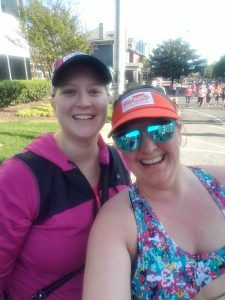 I lost track of how many places that had beer shots for runners! Several of the smaller neighborhoods even had their own race parties going on. So aside from the bands that were performing along the route, you had neighborhoods getting in on the fun and providing their own entertainment for runners! 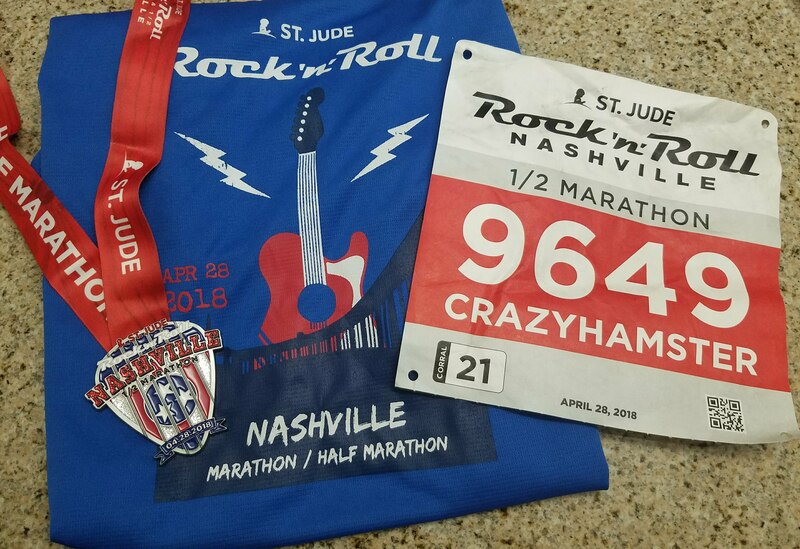 One thing about RnR Races… there are a LOT of runners! 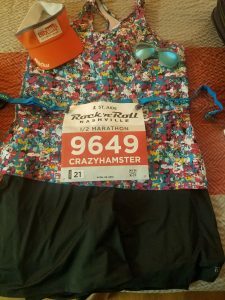 For this race, both the half and the full start at the same time and run the same course until about mile 10-ish. So that means A LOT of people on the same street for a lot of miles. The sea of runners never really thins out. Granted at mile 9, you are not necessarily still running elbow to elbow with other runners, but you are still always surrounded by runners. It often gets frustrating when you are trying to keep your pace and you come across a group that is walking 3-5 across, taking up over half the road and you have to try and get around them. This happened to me several times along the course and it does get frustrating! But it is also a reality of bigger races! Of course, as always, I went with my trusted Skirt Sports gear for race day (ok, yeah I know… every day! LOL). Once again, it was the Long Haul Skirt for the race day win! With 7 pockets, including 2 that hold flasks, I was able to carry everything with me that I needed… and then some! I paired the skirt with my Holiday Print Wonder Girl Tank since I wanted something bright and fun! This was one of the first races I have done in a long time that I felt like I wasn’t just watching the miles go by. So many times, I find myself saying “I’m ONLY at mile X” or “OMG I still have X miles to go”. This race was NOT one of those! I can honestly say that I ran each mile as it came, enjoyed each and every one of them and finished strong with a smile on my face. I’m slowly improving my time with each race and am excited to see where the rest of this year will take me! Was great to get back to Nashville, even if it was only for a night. But with more races to run, I can’t stay in one place very long! Total time spent in Nashville? About 23 hours! Time to hit the road! 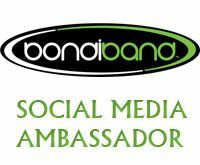 Next stop…. 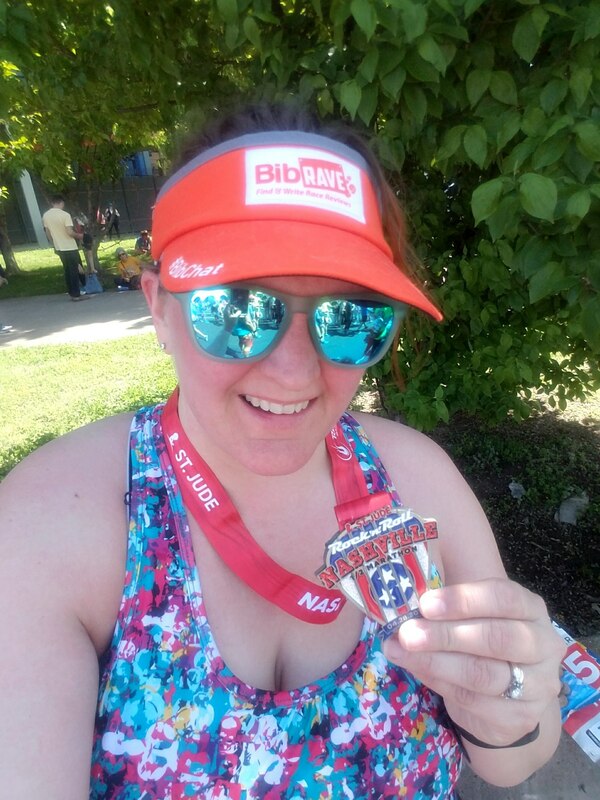 Louisville for my first ever back to back half marathons in one weekend!